David Tyler was born and lived in Abercrave, and served with the Welsh Regiment on the Western Front, where he was killed in action at Ypres in August 1917. 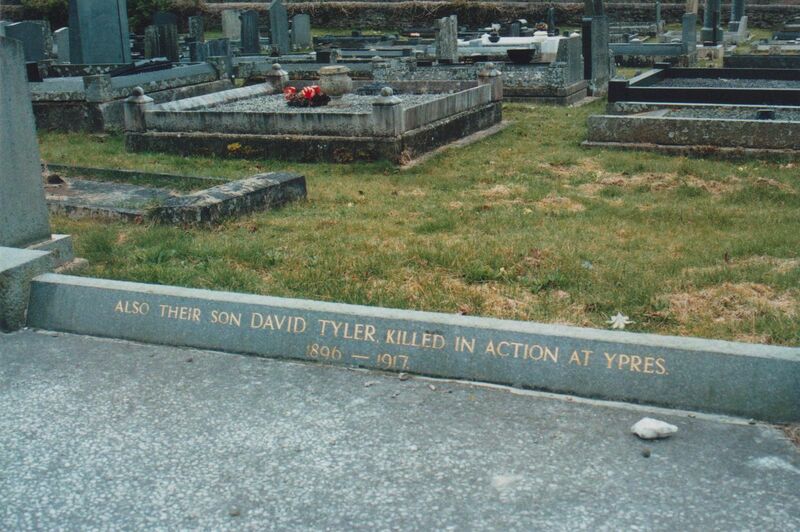 Note that the Ystradgynlais War Memorial lists him as D. Taylor but research by Val Trevallion (Yeargroup) has located nobody of that name from the district, but rather D Tyler as here presented. The information on David Tyler has been compiled from a number of sources, including the Commonwealth War Graves Commission, from the Labour Voice newspaper, and the Parish Burial Register (courtesy of the Swansea Archives). Grave NEW IRISH FARM CEMETERY - BELGIUM; XXV. D. 13. Remembrance Grave Ty ny Coed Congregational Chapel yard, Abercrave, Powys. 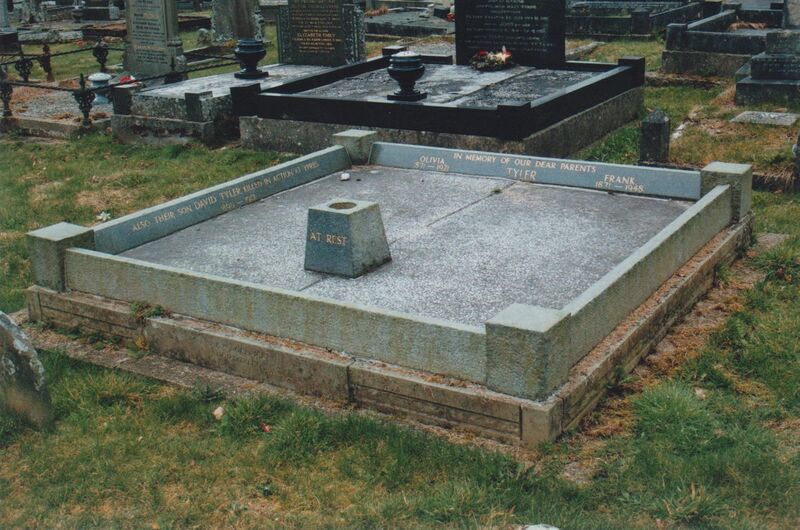 To the left is the remembrance grave in Ty-ny-Coed cemetery, Abercrave. Grave inscription: Killed in action at Ypres 1896-1917. Private David Tyler of the Glamorgan Yeomanry was home on leave this week, returning on Monday. He expects to be drafted out for Foreign Service on Wednesday but the destination is uncertain, the probability being that it will either be Salonika or Egypt. Mr. and Mrs. Frank Tyler, formerly residing at Seagery House, Abercrave, and now of Port Talbot, received the sad news on Friday morning of the death in action of their only son, Pte. David Tyler, Glamorganshire Yeomanry, now attached to the Welsh Regiment. Private Tyler who was 21 years of age, was a young man who was much respected and very popular in the district. Two of his friends from the same regiment, Pte. Johnny Walters and Pte.Willie Owen are lying in hospital at Lincoln and Oxford respectively, having been wounded in the same action. The Labour Voice newspaper for 27th September 1919 includes a Proposed War Memorial List for Abercrave. Within this list appears a David Taylor, but not a David Tyler. It is quite probable that the error over the spelling originated here, and that this article was one of the sources used in compiling the list for the Ystradgynlais war memorial when the British Legion came to do so decades later. Private David Tyler (Glamorganshire Yeomanry) lately attached to the Welsh Regiment, has been killed in action. Two of his regimental friends Privates: J Walters and W Owen (wounded) are lying in hospital at Lincoln and Oxford respectively.